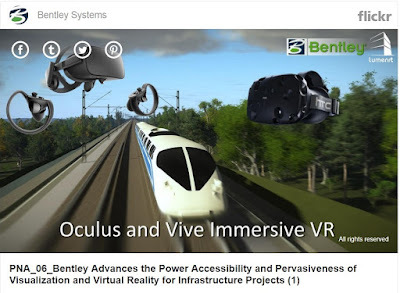 Bentley Systems announces the availability of new capabilities for MicroStation CONNECT Edition that significantly advance the visualization and enhanced reality workflows for anyone involved in infrastructure modeling workflows. Key among the new enhancements is the incorporation of Bentley LumenRT Designer as a no-cost companion install, enabling every user of any Bentley CONNECT Edition design modeling application, such as MicroStation, AECOsim Building Designer, OpenRoads, and OpenPlant, to take advantage of real-time visualization capabilities to complement their existing extensive rendering and animation capabilities. Bentley LumenRT Designer offers a subset of Bentley LumenRT’s extensive environmental content library of vegetation, vehicles, and characters. MicroStation and Bentley LumenRT also provide native support for scalable meshes. Users can leverage Bentley’s ProjectWise ContextShare service to share and stream reality meshes for use in design and visualization workflows.